-JdK- These words were contributed by Bill in Australia. 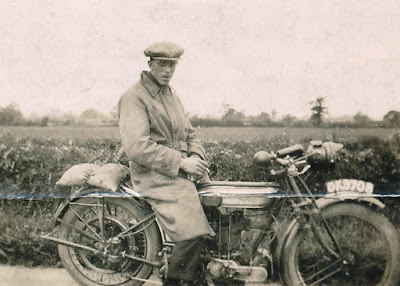 "I have a very old photo (above) of my dad, Bill Truslove on his, I believe, 1923 Norton. He also had a Brough Superior. I was told that he competed in the Isle of Man TT races when he was young. He was born at Burbage in Leicestershire, UK. In 1947, when we were moving house, he threw both motorbikes down the local quarry at Stoney Stanton. He hadn’t ridden them since he had a serious road accident before I was born, in 1936." The Norton is a c1923 Model 18 Norton; note the straight-type rockers. For a 1923 Model it has a non standard specification in that it has a separate oil tank and a Best and Lloyd mechanical pump on the mag drive cover. This appears to feed straight into the front of the crankcase rather than to two unions above the cams as in '24. Also note: no steering damper and supplementary suspension damper on front forks. Registration OK3708 was issued from January 1922 to July 1923 by Birmingham Council.